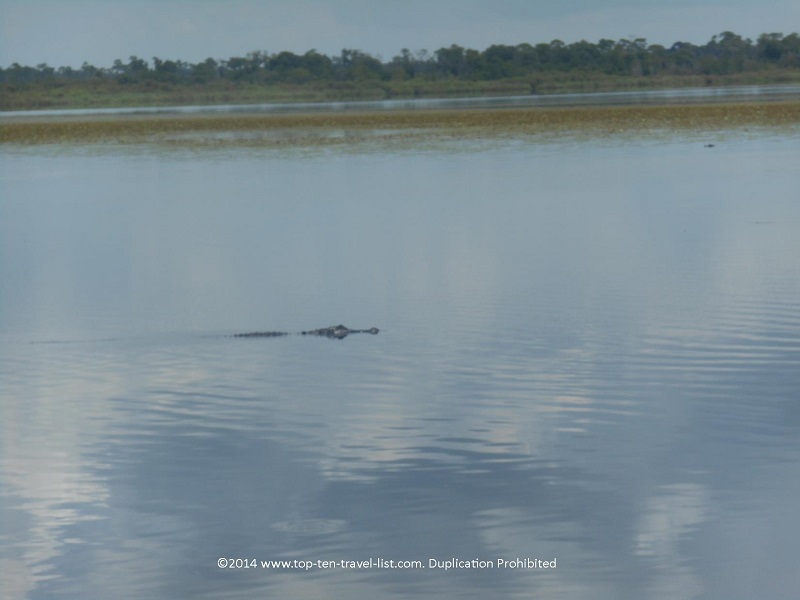 Seeing Alligators in Sarasota, Florida - Top Ten Travel Blog | Our experiences traveling throughout the US. 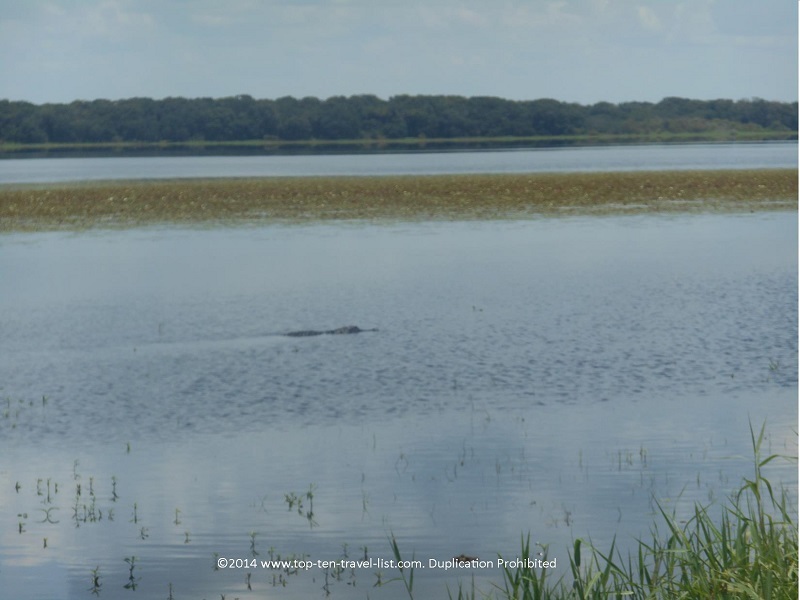 Florida is well-known as being one of the best places in the world for catching a glimpse of an alligator in the wild. In fact, Florida and Louisiana are home to the largest population of American alligators (Louisiana has the highest number of gators). Alligators are widespread throughout the state of Florida. 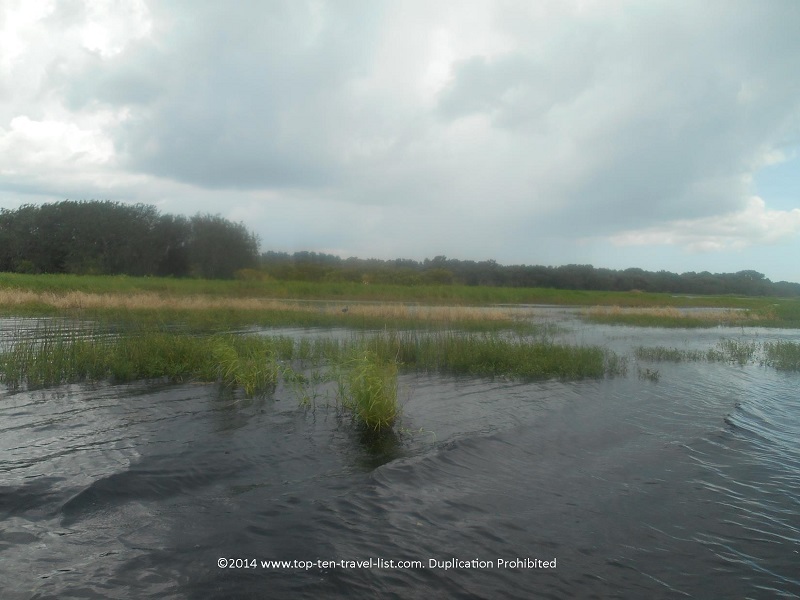 Numerous locations are hotspots for alligators, especially the famous Everglades (located in Southern Florida). However, various other parks in Florida are also home to a large alligator population. 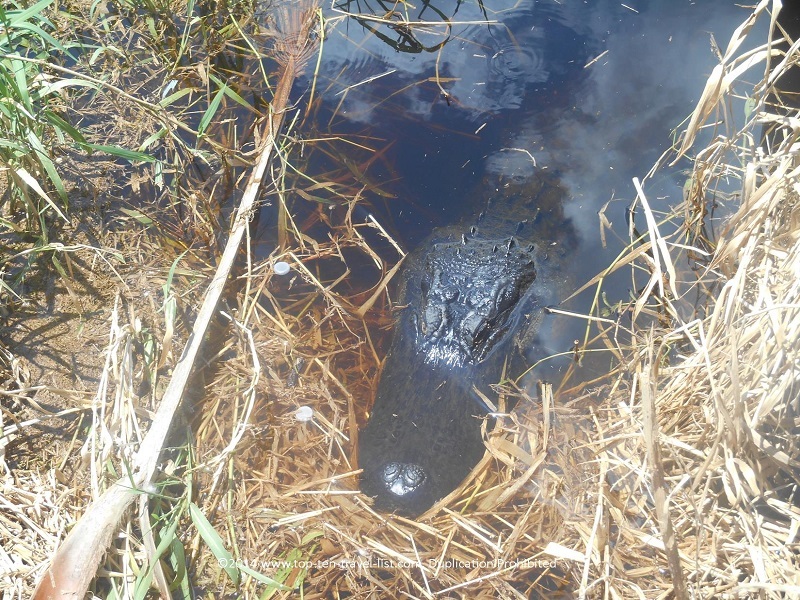 Gators prefer warm conditions, so planning a trip during the insanely hot Florida summer season is probably not your best chance for multiple sightings. In the cooler winter months, you can find them all over the place. However, they do have to come out of the water to breathe, so occasional summer sightings are still possible. Just don’t expect to see hundreds. Your best chance of seeing a gator during the summer months is to take a tour with a knowledgeable guide who know where to find them. 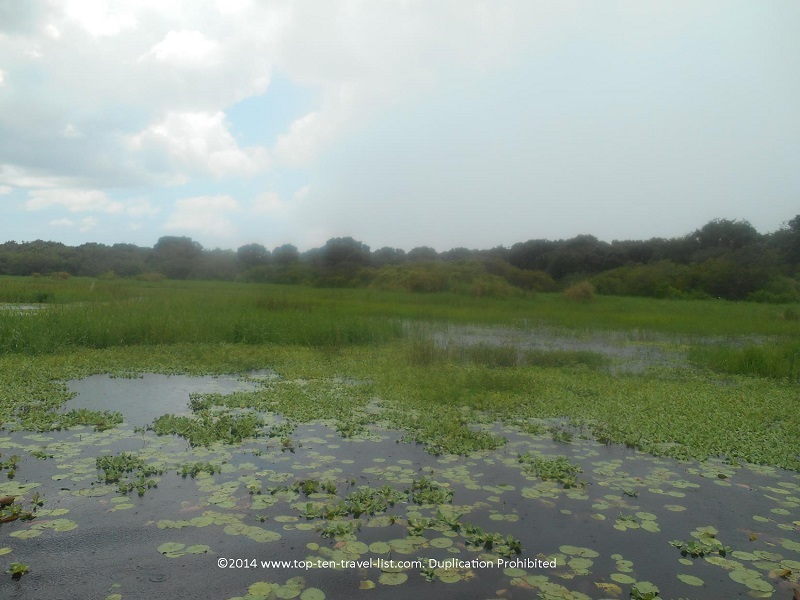 Myakka River State Park in Sarasota offers year round airboat tours on their famous Gator Gal boat. Here’s your chance to see a gator up close! This is actually the safest way to see an alligator, rather than walking near the edge of water on a trail. 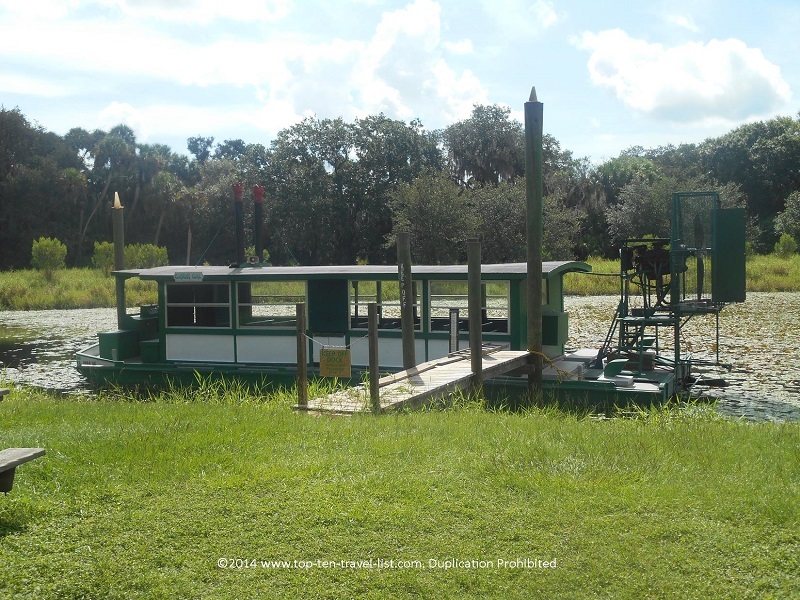 During the 1 hour narrated rides, you will be given a detailed history lesson about alligators, in addition to taking in fabulous views of the Upper Myakka Lake. 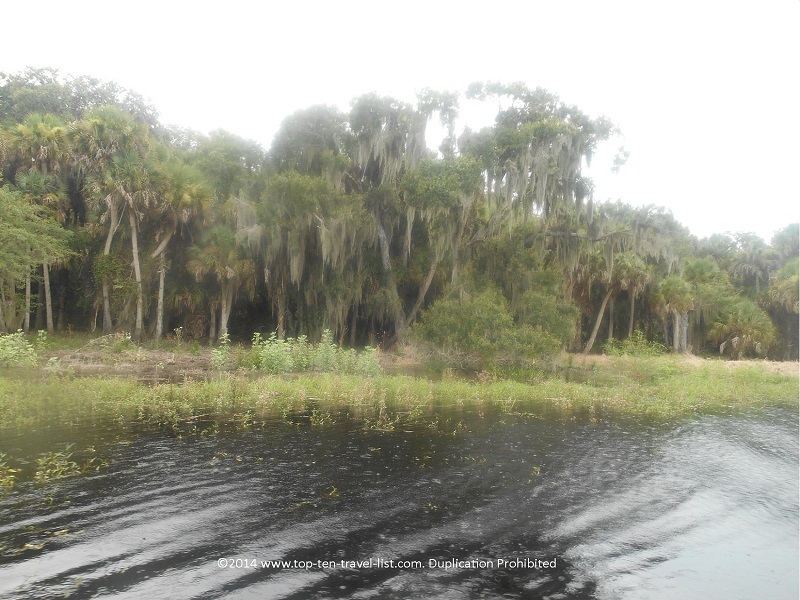 And of course, you will be looking for alligators the entire trip! 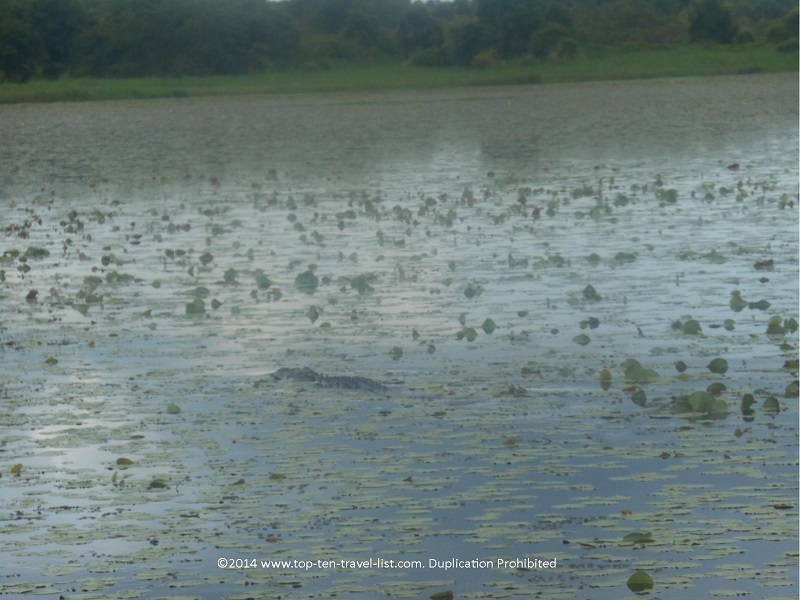 Depending on what time of the year you decide to visit, you could see just one gator or several dozen! During the winter months you will likely see dozens swimming or sitting outside sunning. 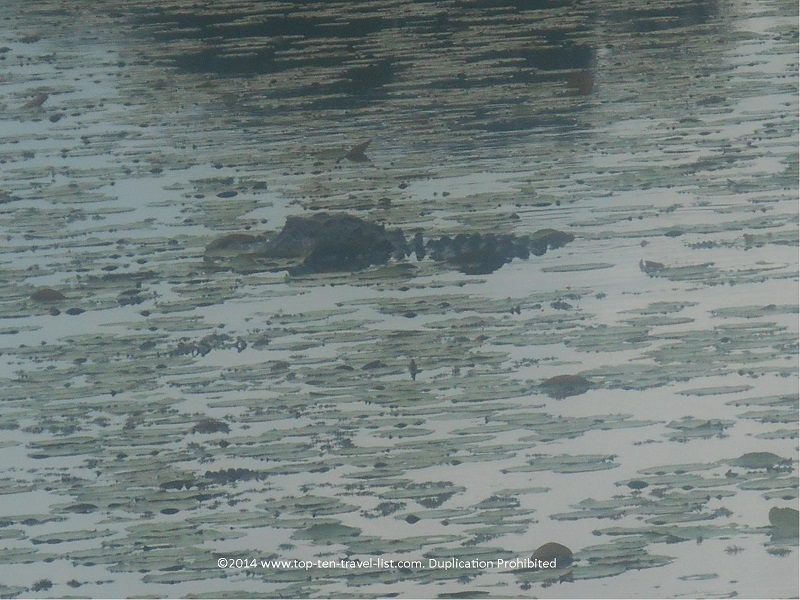 Because our visit fell during one of the hottest months of the year, we weren’t expecting to see many gators. Sightings are not guaranteed, so unfortunately visiting during the summer does not have a bright outlook. We would have been happy to have just seen one as we have never seen one in the wild. Fortunately, we saw about 6 during our hour journey. Your tour guide will try to get up as close as possible to give everyone in the boat a good view. Unfortunately, the gators tend to disappear as soon as the boat starts moving. You have to be really quick with your camera, or better yet, take the picture from afar with a high zoom lens. Although most of the trip we were pretty far away when a sighting occurred, we were able to capture a few decent photos. Alligators duck under the water pretty fast when they see you coming, so getting a quality photo with such few sightings was a difficult task. In the winter months with numerous sightings, you should have more opportunities to get a better shot. 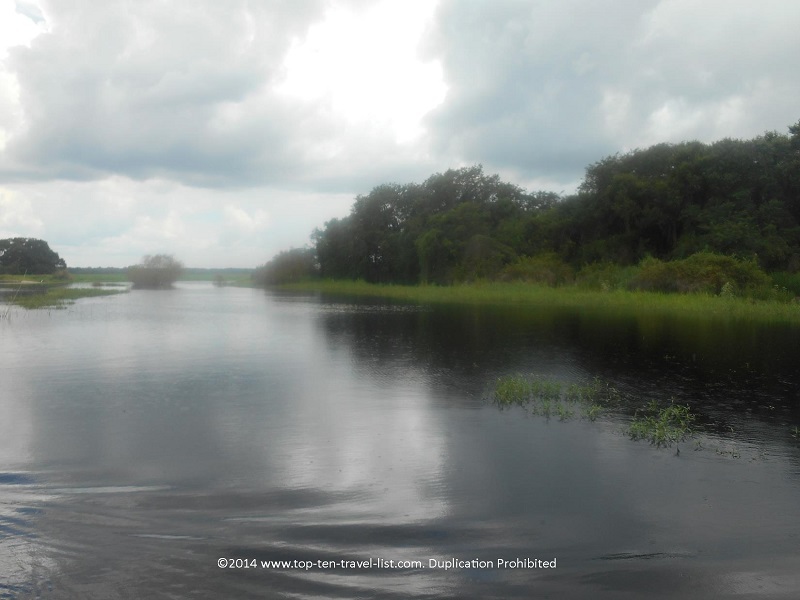 Overall, the cruise was wonderful with beautiful views, great gator sightings for this time of year, and plenty of interesting facts and stories shared by the tour guide. The small admission price is worth it for the spectacular views of the lake alone. *While waiting for your cruise, be sure to take the short dirt trail leading to a scenic overlook of the lake. 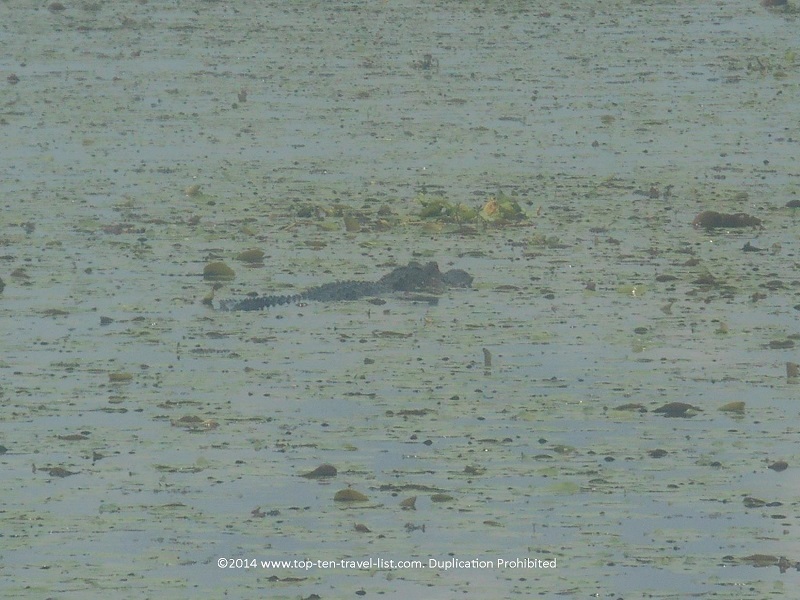 Not only is it an excellent location for lake photography, but you may get lucky and see an alligator. 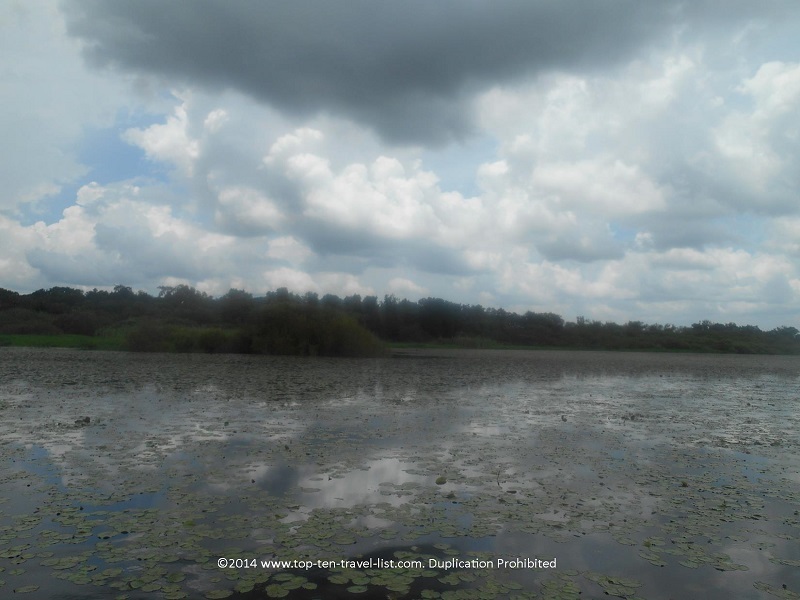 Alligators are known to hang around this area and sightings are frequent. We saw several gators swimming and one half way out of the water. The trail is located just across from the ticket booth (ask someone if you aren’t sure where to go). *The oldest alligator lived to be 79. *There are 2 types of alligator: American and Chinese alligators. Chinese alligators are endangered due to the pollution in the water. *Louisiana is home to the largest population of American alligators. *American alligators are more than 150 million years old. *Alligators are carnivores. They will eat a human, but only if no other food source is available. Watch your pets – they have been known to grab one walking too close to the water. *American alligators are only found in the Southeastern US states. *American alligators can weight up to 1000 lbs. 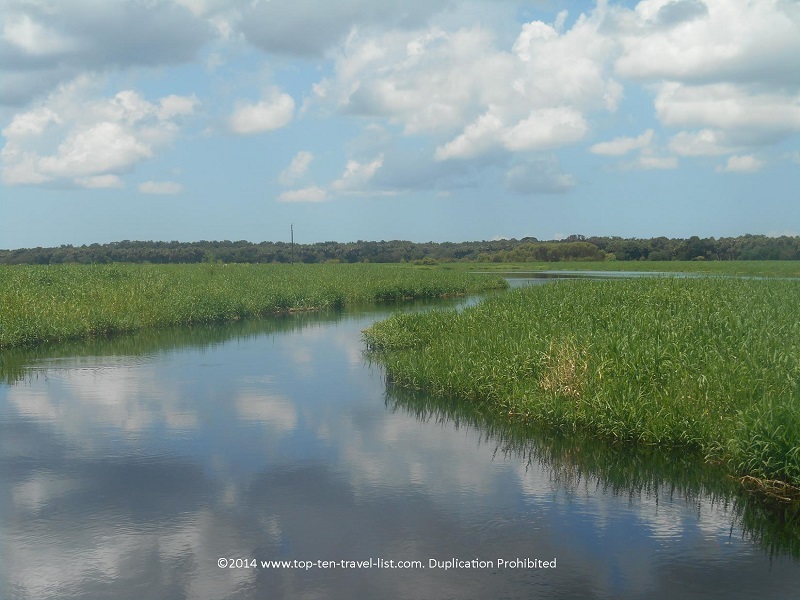 *Myakka River State Park is home to 5000-6000 gators. *American alligators can live up to approximately 50 years in the wild. *Swamps and wetlands are their preferred home, although they can be found in any body of water. *American Alligators prefer warm weather and warm water, which is why you see them more during Florida’s winter season. Summer is too hot. You will learn these facts and many more during the duration of your cruise! *Get to Myakka early. Reservations are not accepted for the Gator Gal airboat ride and lines fill up very quickly. You will want to get there as early as possible in case your 1st preferred tour is sold out. *Plan a winter visit for the best chance of multiple sightings. *Bring with a camera, preferably one with a good zoom lens. *Pick up a Sarasota coupon booklet (located in various stands throughout town) to save $2 off your cruise. *Save your receipt for 1/2 off your next cruise. *Plan a picnic before/after your cruise. 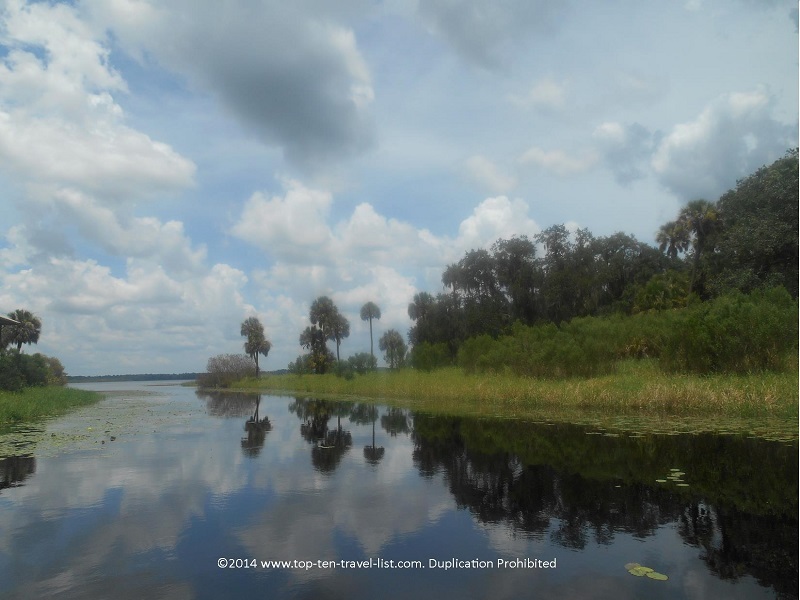 Myakka is a beautiful state park with plenty of scenic areas to picnic. What’s better than lunch surrounded by gorgeous views? 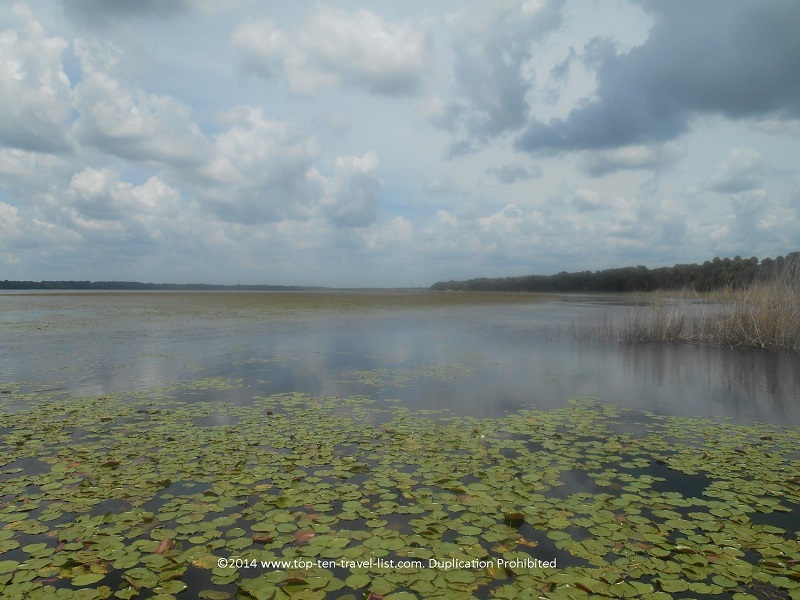 *There are plenty of other great activities at Myakka. I recommend the canopy walk and observation tour, the 6+ mile paved bike path/scenic drive, and a walk along bird walk and the nature trail. 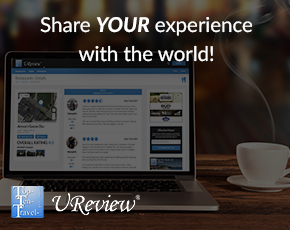 You will receive a map and detailed information booklets from the parking attendant. 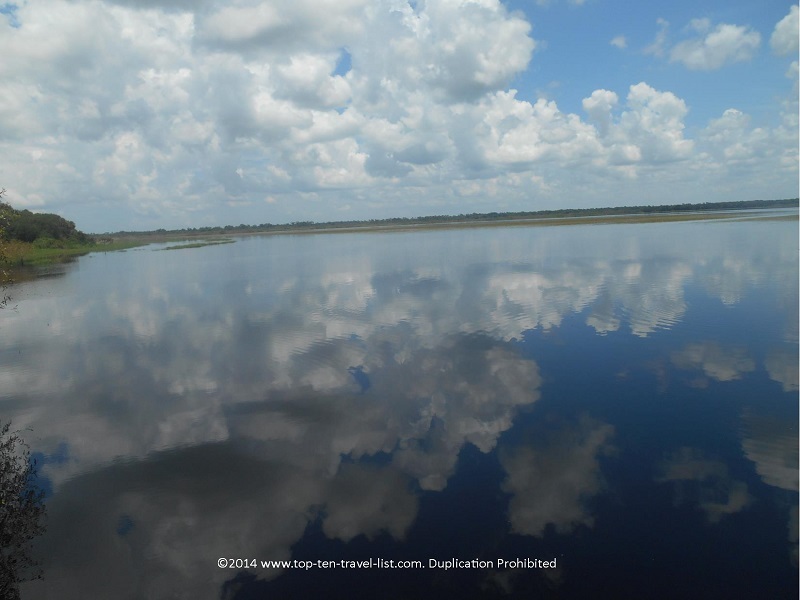 Myakka River State Park is located at 13208 State Road 72 in Sarasota, Florida. Parking is $6 per vehicle (2-8 people) and $4 for single riders. The Gator Gal cruise is $12 per adult and $6 for children ages 6-12. 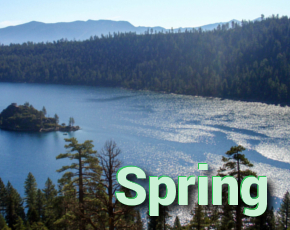 Tours run at 10:00am, 11:30am, 1:00pm & 2:30pm (the 2:30pm cruise only runs during the winter season). Open everyday except Christmas.